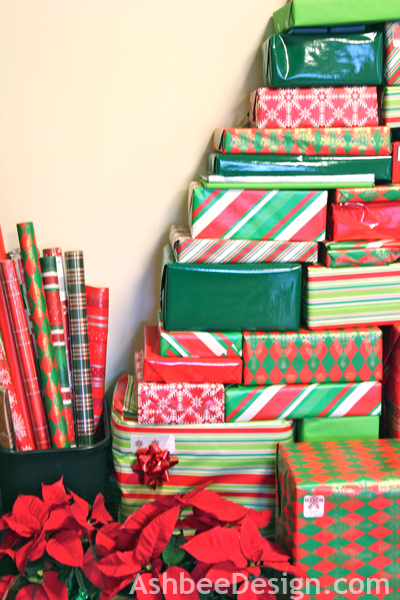 During the Christmas season I set-up a wrapping station in the family room. It stays set up so I make it pretty - but convenient. Our tree doesn't go up until the kids come home which will be Dec. 22nd so I always have a collection of wrapped gifts. 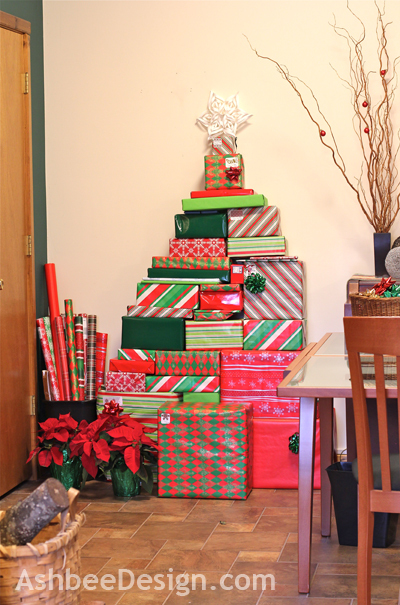 The alternative Christmas tree ideas shared on the web inspired me to be a little creative with my pile. I left off most of the ribbons until later and stacked them into a Christmas Tree! Added a whole new twist to wrapping. I do have to admit that as presents have been wrapped, I have re-stacked this three times and the square box on the right? Yeah, that continues to be a challenge to the composition! Hope you are having fun with your holiday prep as well. I love your imagination....a wonderful tree.